So, what did I get in the week of Sunday, December 7th to Saturday, December 13th? I believe I have some packages at home! Otherwise, I've received nothing this week. 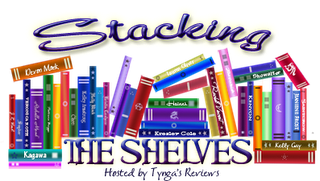 I haven't missed an STS post since I started blogging, so I didn't want to skip this week... despite the dismal amount of shelf-stacking happening. So this week's edition will be more of an updates thing. THANK GOODNESS FOR NO NEW BOOKS THOUGH. First week of finals was rough. Second week might be just as bad, who knows. This coming week in blogging might be very slow for me. BUT. I'll be home on the 19th! Hey take things easy. We all miss things. RL can be extremely busy and sometimes we need to take time for ourselves. Good luck on finals. I shall! That's definitely true. Thank you so much! I hope your finals went well. I'm going to be sleeping for days to recuperate myself. Happy relaxing! I have another week of finals! No relaxing happening any time soon! Oh god that's awful. In that case, good luck!! EEP! Always hated finals week! It was sooo dreadful...unless the final was a paper or project, then I could totally handle that! LOL! Hope you have some surprises waiting for you at home then! Good luck with finals and then enjoy your break! Seriously though - and in some classes, I have both the term paper and the final... it's crazy. Thank you, Jessica! It's okay! Finals come first. Thank you very much, Carina! Haha. Thank you! And good luck!! I used to never miss mailbox or stacking posts but I cut way back on buying and requesting lately since I have a lot less time to read. It's nice having a little break. Happy Holidays & Happy Reading! Right?! I haven't been requesting and buying much recently. Which is fine, like you said. Thank you! It is good to have slow weeks, like you I have too many to read, but I love them all! I agree! I need to slow it down. I'm pretty sure you'll have something at home, but you are right the TBR pile can use a week or two of no books sometimes! Best of luck on the damned finals, just one more week and you can do it!! Yup! Especially with me not reading as much during final weeks. I need to "catch up"! Though I'm not really behind. Good luck on your finals. I'm sure you will do well. I look forward to seeing what is waiting for you in those packages you have at home. Happy reading and hope you have a great week. Haha thanks! And I'll be doing just that on the Saturday coming.